In the spring of 1966, while the war in Vietnam was still popular, the U.S. military decided to reactivate the 9th Infantry Division as part of the military buildup. Across the nation, farm boys from the Midwest, surfers from California, city-slickers from Cleveland, and share croppers from the South opened their mail to find greetings from Uncle Sam. The newly-shorn men in their ill-fitting uniforms got off the busses together at Fort Riley, Kansas, to be trained together under the tutelage of officers and non-commissioned officers (NCOs) who would lead them into battle in Vietnam. Charlie Company was part of the 9th and was representative of the greater whole. Everyone was there in the newly-raised company – the joker who roller skated into the Company First Sergeant’s office wearing a dress, the nerdy guy with two left feet who would rather be off somewhere inventing computers, the gung-ho true believers bent on outshining everyone else, the everyman who just wanted to get through un-noticed, the guys who liked Motown, the guys who liked country music. Most American soldiers of the Vietnam era trickled into the war zone as individual replacements for men who had become casualties or had rotated home, embarking on a wartime experience unparalleled in its individualism. Charlie Company, though, was different, part of the only division raised, drafted and trained for service in the Vietnam War. During their training, the men of Charlie Company, a unit almost entirely composed of draftees, became a family without ever really knowing it. Its members entered Vietnam as brothers, sometimes squabbling, sometimes joking, sometimes missing their wives and children, but always brothers. Charlie Company was a throwback, part of an old breed. 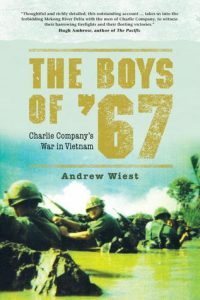 Charlie Company’s experience of being drafted, thrown together, and trained for war hearkened back to the very heart of the American military tradition, a tradition that came to an end in Vietnam. A tradition that might never return, leaving Charlie Company historically the last of its kind. This is their story. From draft to the battlefields of South Vietnam, this is the unvarnished truth from the fear of death, the chaos of battle, the horrors of injury told through the recollections of the men themselves.